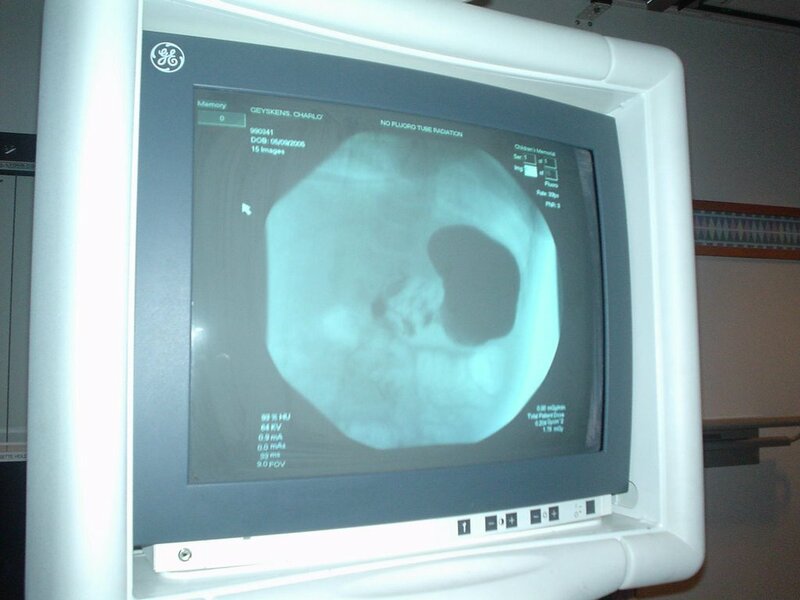 Before Charlotte’s G-tube was inserted, she needed to have an x-ray to “rule out malrotation of the abdomen.” In other words, Dr. Reynolds wanted to make sure that Charlotte’s GI tract was normal. She had to fast for 4 hours prior to the procedure. Then she drank a bottle that was mostly barium–a substance than can be seen by x-ray. 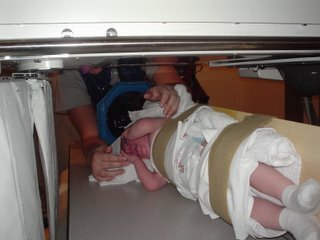 For the x-ray, she was strapped to narrow board (like the VQ scan of her lungs last month). I fed her the barium bottle which she just about guzzled down while the Radiology resident looked for the views he needed. She was strapped down for about 30+ minutes while we waited for the barium mixture to move from her tummy into her dudenum, the upper part of her small intestine. 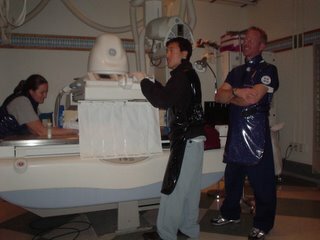 The radiology technicians kept rotating the board, mostly on her right side, to help the mixture move. As you probably realize, everything was perfectly normal. Dr. Chon took one more picture, this time after we fed Charlotte as much as she could possibly eat lying on her back. The last picture was of the top of her abdomen to confirm that she has no reflux.